We all remember the snowmen we made when we were kids. 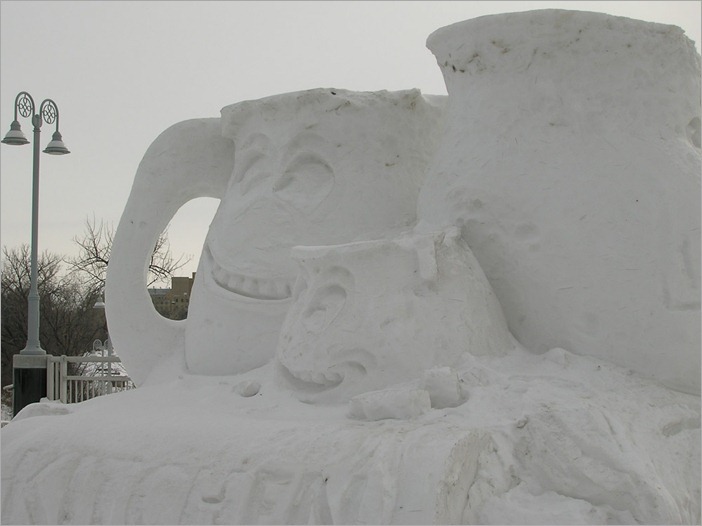 They were the most magnificent snowmen in the world. Or at least of the city, village. Maybe of the yard. Come to think of it, they looked perhaps a bit like a few lumps of snow fitted together to have a more or less human form. Adorned with a few pieces of coal for the mouth and the buttons, and a carrot for a nose. They were the most beautiful. Of course we grew out of that and now we only make the same kind of snowmen with our kids. Some people however, never grew out of making snowmen. Finally they got better in making them. But after a while they wanted something bigger, better and less looking like a snowman. This is where the Snow Sculptors start. In climates cold enough to get snow in big quantities in winter there is material to work with. 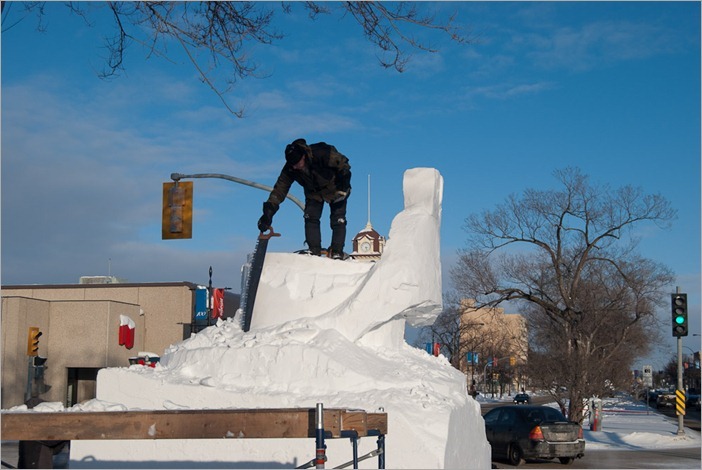 Here in Winnipeg, we have to get the material from outside the city, we cannot leave the snow accumulate that much. Once nicely packed it will be delivered as blocks in different places in the city. Just blocks. 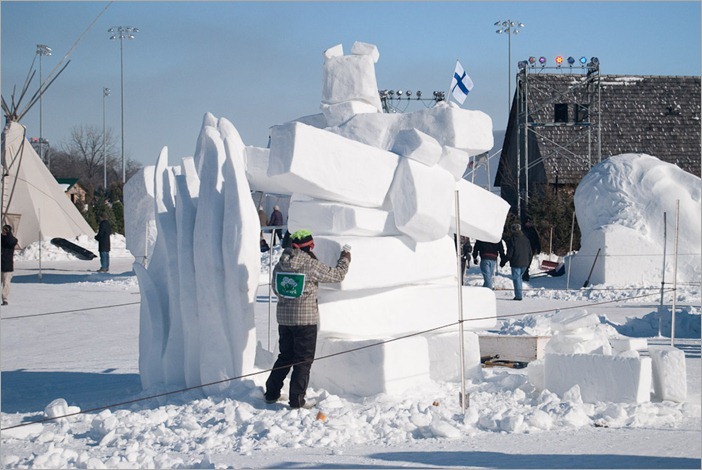 That’s where the snow sculptors come in. Visibly they use very different tools to get their sculptures than I had when making my snowman… And they work with plans that not only exist in their heads. A few hours later, the weather got better and I got more colour in the picture. As you can see, the packed snow block is dense enough to support the weight of a man. My snowman didn’t even last until the end of winter! I definitely did something wrong back then. 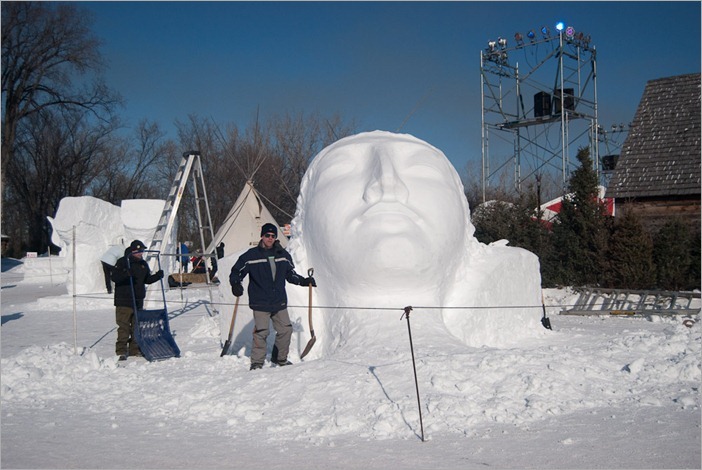 Then comes the Festival du Voyageur. Now that’s a whole different story. 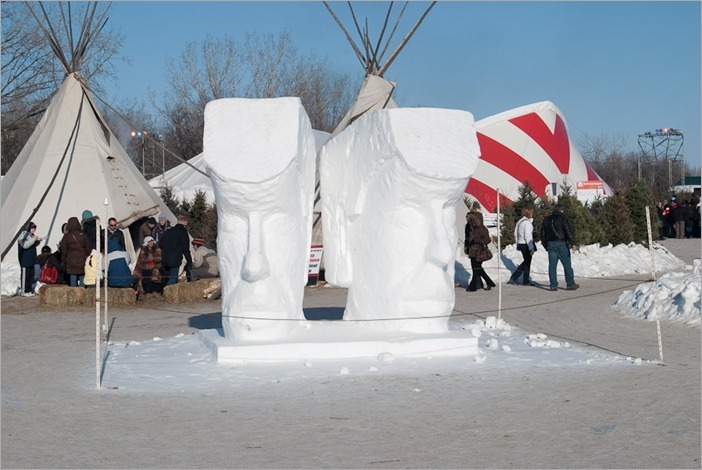 The Festival du Voyageur will exist this year for more than 40 years. The 40th anniversary was in 2009. It is a festival of travellers, travel stories and people. All kinds of people come together and present their culture. From the First Nations to the French and even the English, you can also find Australian, Finnish, German and more. All have a story to tell and all have their interest. 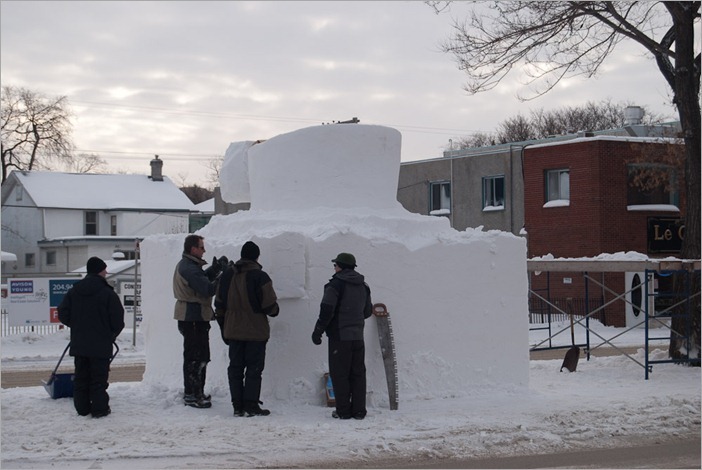 That is the big interest of the Festival du Voyageur. And of course the Festival also attracts sculptors from all over the world. 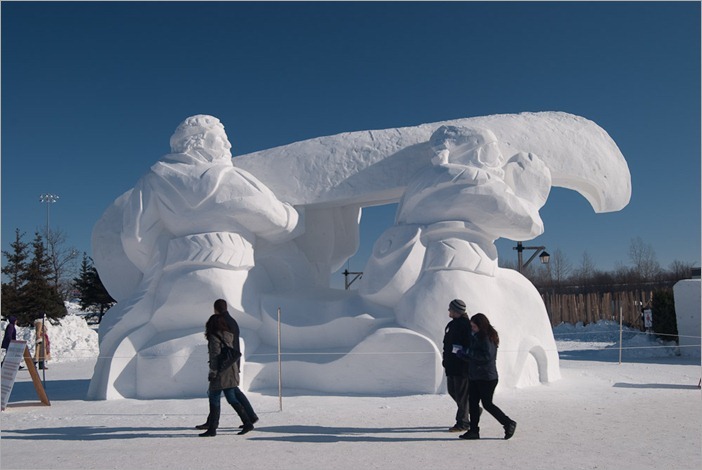 Here are some sculptures from people that do not live in Canada. Now when I took this picture, there had been a few days of warm weather and I thought that the sculpture was broken. I was wrong. This was the intended sculpture. Sculptures took a little more time to be finished, due to some warm weather the days before. All these are on the premises of Fort Gibraltar. Now, all of these sculptures look like they have a human dimension, not too big, not too high and we might think that this is the maximum size of these sculptures. Well… we’re wrong again. This is the sculpture at the entrance of last year’s (2009) Festival. I waited to get some people in front of it to get an idea of the size of the sculpture. That gives us a chance to hope for the next year’s Festival with its plethora of sculptures, sculptors and craftsmen.